Hi, my name is James, and I want to thank you for visiting my website. Since you’re here, I’m going to assume you’re looking to buy an air purifier, or you simply want to find out how they work before purchasing one. One of the most difficult things I found with buying air filters is the infinite amount of choice, and that’s where I aim to help. What you will find in the following pages are not just good, honest reviews with little to no technical jargon but a smattering of informational pages as well. What I hope is that you not only grow to see my website as a place where you can find the perfect purifier, but can also find out what you need to know without spending hours trawling the internet! Although I consider my articles to be pretty concise, I realize that some of you may not have the time to read through all of the reviews I have written here. If that’s the case, I have prepared a comparison table which provides you with a brief overview of all the air purifiers I have included. In it, you will find category, performance and other notable features. If you do find time for that cup of coffee whilst looking through the table, feel free to click on the link at the end which will conveniently take you to the whole review. Another shortcut for quickly selecting the right air purifier is my selection of best air purifiers, which I picked based on specific tasks, area and price. Just check out my top picks, or simply click on one of the best picks below. If you’re reading this it means you’re still on board, and that’s great. It also means (hopefully) that you’re looking for some additional information before you go ahead and buy an air purifier. I know there are plenty of things to take into account such as types of filter, air flow rate, the number of air changes per hour, CADR ratings and more. If you’re not familiar with these terms, don’t worry because the following articles are here to guide you through the world of air purifiers. I would recommend you start by reading my buying guide which I wrote with the goal of shedding some light on the most important features and functionalities of an air purifier. Once you’ve gotten yourself acquainted with all the crucial facts and terms, you can go on to read other informational articles on my website. Clean Air Delivery Rate (CADR) indicates an air cleaner’s capability for filtering out airborne pollutants such as dust, pollen and smoke. There is a separate rating given out for each of these three pollutants. The CADR rating is in direct correlation with the type and the size of the filter that is used by the air purifier. The air flow is dependent on the speed of the fan built into a purifier as well as the type of filter used. The number of air changes is also dependent on the size of the room. You can find out all about that in this article. Since HEPA filters are the most common option and also one of the most effective, I have written a separate article explaining how they work, how they are made, and which things you should look out for. I’m hoping this will be more than enough to get you started, and should you so wish, there is more “informational” reading further down the page. The Winix PlasmaWave 5300-2 Air Cleaner offers a 3-stage filtering system with PlasmaWave technology and a built-in air quality sensor at an extremely affordable price. On top of that, it’s suitable for large rooms of up to 350 square feet. If you need even more coverage than that, up to 500 square feet, the Whirlpool Whispure 510 is a great choice as well. With raving customer reviews and a very reasonable price tag, this air cleaner seems like a perfect choice. It’s sleek, slim and lighweight, making it portable and easy to use anywhere in your home, but thanks to the extreme low noise levels it’s best used in the bedroom. 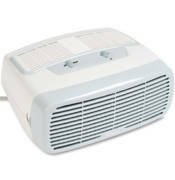 The Honeywell True HEPA HPA 300 Allergen Remover is built specifically for medium size rooms of about 465 square feet. Its high quality filters will strip up to 99.97% of allergens and irritants from the air, and with three speed settings, you can adjust it to match the amount of irritants in your room at any given time. The Winix WAC9500 Pet Air Cleaner isn’t lying when it says it is the ultimate choice for those who want to remove pet related irritants from the air. Its three stage system works to remove large annoyances such as hair, then smaller irritants like dander, before, finally, neutralizing odors. It contains a high-quality True HEPA filter and special PlasmaWave Technology. 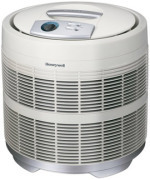 The Honeywell 50250-S features a patented 360-degree airflow system, a permanent HEPA filter designed to remove the smallest of irritants and allergens from the air, and a carbon pre-filter for those larger particles. All this function and an easy-to-use control panel for a fraction of the price associated with similar machines – what more could you ask for? If money is no object, consider yourself lucky because you have the opportunity to buy the Blueair 403 HepaSilent Air-Purification System air purifier. It beats the competition in many respects, but one feature that impressed me the most was its galvanized steel casing making this unit one of the most robust out there. The Alen BreatheSmart HEPA Air Purifier wins the coveted title for being the quietest purifier I have come across. Apart from being extremely quiet at all fan speeds, the overall performance earns this model a place in my top picks. Although quite expensive and often used for commercial purposes, the undisputed winner of this category is the IQAir® New Edition HealthPro Plus Air Purifier. With its superior noise suppression, 4-stage filtration system which includes HyperHEPA filters and the ability to filter out dust, allergens, as well as smoke, fumes and gases, you just can’t go wrong! The Holmes HAP242-NUC is the best small room air cleaner for me. Apart from the miniature size and silent operation, it has the ability to remove dust, allergens, smoke and airborne bacteria like Candida, E-coli, Giardia, Salmonella, Cryptosporidium and Legionella. In close second place for this category is the Honeywell HHT011. The Austin Health Mate HM450+ with its carbon-zeolite filter has the ability to not only filter smoke, but also benzene, wood smoke, formaldehyde and VOCs in addition to dust and allergens. If you have smokers in the house, this model is definitely worth a closer look! The Surround Air XJ-3800 Intelli-Pro Air Purifier which includes a massive 7 filters that all work together in order to give you the cleanest air had to be included in my top picks. In my opinion, it’s one of the most effective air cleaners you can get. Its ionizer deals with most contaminants and ensures quiet operation. The O-Ion B-1000 is quite advanced for its affordable price. Best used in small rooms, this tall yet compact air purifier combines carbon filtration with an ionizer and a UV light to expel dust, germs, and allergens from your small space. You really cannot beat this quality for this price. So you’ve decided to miss out my top picks (or not, as the case may be). Either way, I don’t mind because it means you’re interested in finding out more about air purifiers, and what they do. The numbers listed in the specs of the cleaner do not translate perfectly into real life, including the size of the room for which the purifier is recommended. Several factors play a role in sizing an air purifier all of which I’ve included in this article. Even though most air cleaners nowadays have HEPA filters, a lot of them come with pre-filters and/or activated charcoal (carbon) filters which significantly increase their filtering capabilities. To find out how they work and why they’re a nice feature to have, check out my article on them. In addition to HEPA filtering, air purifiers can have an additional filtering system which may employ electrostatic, ionic, UV or thermodynamic filtering technology. Each one of these is thoroughly explained in this article. While the cleaner’s primary task is to filter the air inside your home, its performance and day-to-day user experience can be enhanced by a number of features and/or optional extras. These might include sensors, automated modes, remote control and many other options. Since air purifiers are suitable for treating a wide spectrum of contaminants such as dust, allergens, dust mites, pet dander and hairs, bacteria, viruses, mildew and mold spores, I have taken a look at how each of these particles are treated and then removed from circulation. For those of you who suffer from allergies and asthma (and I feel your pain), I’ve decided to explain more about the subject and what you can do to help reduce all that coughing, wheezing and sneezing! I have brought the website you see before you to the internet not because I’m in the business of air purifiers. In fact, it’s quite the opposite as I know what it’s like to suffer from various ailments caused by contaminated air, as I suffered from allergies and frequent asthma attacks. So, I decided to find a solution to my problem and it didn’t take long before I came across air purifiers. Thinking the only thing I had to do was pick one, order it, and my problems would be solved, I soon discovered I was wrong. The more knowledge I gained on how air purifiers work, the more information kept popping up. As a result, I’ve decided to share my new found knowledge with you in the hope you don’t have to take up as much time as I did trying to find the right air purifier. What you will find in the following pages are not just good, honest reviews with little to no technical jargon but a smattering of informational pages as well. What I hope is that you not only grow to see my website as a place where you can find the perfect purifier, but can also find out what you need to know without spending hours trawling the internet. I’ve done my best to make sure the information and reviews you find here are to the point, honest and easy to understand. All that’s left to say is enjoy, and I hope you manage to find an air purifier that will finally let you breathe easy. Your fellow “clean air” fanatic James.